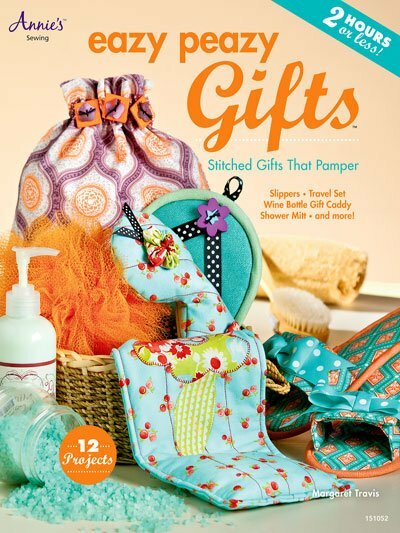 Our latest book “Eazy Peazy Gifts - Stitched Gifts That Pamper “ is out! Published by Annie’s Publishing it's filled with personal and practical designs and all of course are Eazy Peazy. Everyone...including beginners can sew them and each of the 12 patterns can be done in 2 hours or less which makes them ideal for classes. In the “Can you see me blushing?” category, here are comments from a couple of nationally-known sewers and quilters. Eazy Peazy does not sell to retail customers but you can find a copy of "Eazy Peazy Gifts" in your favorite quilt shop or in Annie's Catalog.